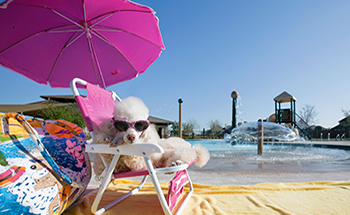 Riverstone residents enjoy resort-style living each summer as community pools offer a chance to stay cool and relax with family and friends. Residents have use of several pools, including a lushly landscaped swimming complex overlooking one of many community lakes. Rock waterfalls add to the pool’s ambiance. Two more pools can be found at the Creekstone Village Recreation Center and the Riverstone Boulevard Recreation Center, further adding to the great recreational opportunities at Riverstone.